LAWA releases Draft EIR for LAX Specific Plan Amendment Study On Friday, July 27 Los Angeles World Airports (LAWA) released the Draft Environmental Impact Report (DRAFT EIR) for the Los Angeles International Airport (LAX) Specific Plan Amendment Study (SPAS) and the SPAS Report. The more than 1,800 page document includes nine proposals for LAX’s North Airfield, which are meant to increase safety and security and take into account environmental and financial implications, according to LAWA. One option includes moving the northernmost runway 350 feet towards Westchester and Playa del Rey. good relationship with our officers. We wish we had more resources for non-emergency calls, but I always hear good feedback when I talk to people about our officers.” Everyone interested in playing softball will have the option of playing. There will be mixed-teams of all ages and abilities. A 16” softball will be used and gloves are optional. Pacific Area Captain Jon Peters and members of the Neighborhood Council of Westchester/ Playa are expected to take part in the game. The event will take place at Westchester Park, located at 7000 W. Manchester Ave. in Westchester. Parking is encouraged close to Baseball Diamond #1 at Lincoln Boulevard La Tijera or Manchester at Georgetown Ave. This event is made possible thanks to the Pacific Community Police Advisory Board (CPAB), Pacific Boosters, the Neighborhood Councils of Westchester/ Playa, Venice, Del Rey, Mar Vista and Palms,LA City Parks and Councilman Bill Rosendahl’s Office. For more information, please visit ncwpdr.org. At left: Members of LAPD pose at last year’s parade. PHOTO BY GLENN MARZANO. Worship Service 10:30 am Canines@Covenant 5:00 pm Sunday Covenant on the Corner 80th and Sepulveda Blvd. A place has been saved for you. ������������������������������������������������������� Westchester Lutheran School has a place for students in Preschool through 8th grade. At Westchester Lutheran School, all are welcome, all are valued, and all are enabled to excel. Our faculty, staff, parents, and extended church family work together to support our students throughout their journey, supplying them with the educational emotional, and spiritual resources they need to make that journey as successful as possible. Call for a tour. � � � �� � � � � � � � � � � � � Westchester Lutheran Church also has a place for you in our family of faith. We ��������������������� are eager to have you join us in worship, fellowship, and service. A plane ﬂies over Westchester’s business district. FILE PHOTO. Western Ave. Los Angeles. • Culver City Library, 4975 Overland Avenue, Culver City. • Inglewood Library, 101 West Manchester Blvd., Inglewood. • El Segundo Library, 111 West Mariposa Ave., El Segundo. • Hawthorne Library, 12700 Grevillea Ave., Hawthorne. Written comments on the SPAS Draft EIR can be submitted within a 75-day window of its release, which concludes Wednesday, October 10, 2012. Written comments can be submitted at any of the three public meetings; by e-mail to spaseircomments@lawa.org; or submitted to: Los Angeles World Airports, Facilities Planning Division, Attention: Diego Alvarez, One World Way, Los Angeles, CA 90045-5803. 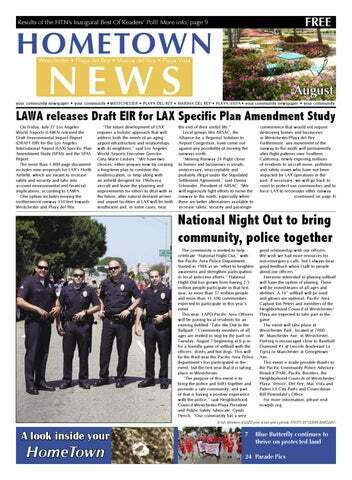 For more information on the Draft EIR, to download a copy of the Draft EIR or the SPAS Report, or to submit a comment electronically, please visit laxspas.org. COURSES FOR YOUR CAREER OR JUST FOR FUN LMU Extension is here. In class and Online. What would you like to learn today? At LMU Extension, continuing education is directly engaged with the lived experience of the community. Our goal is to provide you with opportunities to further develop your imagination, conscience and intellect, whether it is on the campus or online. Programs are taught by leading scholars and professionals, and balance traditional academic study with necessary practical training. Alcohol and Drug Counseling Choral and Ensemble Performance Digital Arts and Design Grant Writing Human Resources Management Ministry, Theology and Philosophy Nonproﬁt Fundraising Studio Arts and Languages Yoga Therapy and Teacher Training ... and much, much more. Visit us online at http://extension.lmu.edu. Contact us at 310.338.1971 or extension@lmu.edu. Kathy & Bill Your Local Celebrity/Entertainment Photographers are now available to YOU. Runners participate in last year’s race. PHOTO BY DIANNA HOFFMAN. Team, will start the runners off in the official pace car. There will be an opportunity drawing to win an 8 day/7 night Pleasant Hawaiian vacation for 2 at the Royal Lahaina Resort on Maui, compliments of the William H. Hannon Foundation. Food will be available for purchase at food trucks on site. There will be prizes offered for the best costume.After-race refreshments for participants will be provided, as well as an expo, music and lots of great fun. Those interested in participating can register online at www. w2promotions.com or by emailing jill@airportmarina.org. For more information, please call (310) 670-1410-x103. Studio: 310.301.1576 Info@bcs76.com www.bcs76.com Call/Email for details & Booking Today! Parking Fees at Loyola Marymount University Loyola Marymount University has charged for on-campus parking since the early 1970s. That changed in January 2000 when University Hall was purchased. As part of the Conditional Use Permit tied to the acquisition of the building, LMU agreed not to charge for parking on campus. It is hoped because of the new parking fees, many students and employees that live less than one mile from campus will choose to walk or bike to LMU. Those who live between one and three miles from campus may also choose to bike or take a short transit ride to campus. LMU’s Master Plan became eﬀective in April 2011, which allows the university to once again charge for parking as part of a general parking management program designed to address parking demand as well as comply with the mandate to add more parking on campus. In September 2011, LMU held its ﬁrst quarterly Neighborhood Advisory Committee meeting and announced that the university would charge for parking. The provisions of the Master Plan also has LMU set aside $24,000 annually to pay for neighbors’ parking permits if a permit parking district is established at the request of the neighbors. In November 2011, LMU and the Neighborhood Advisory Committee members, including a representative from Councilman Bill Rosendahl’s oﬃce, met with representatives from the L.A. Department of Transportation to discuss the regulations surrounding the formation of permit parking districts. During the meeting it was learned that the LADOT instituted a moratorium on new parking permit districts in 2010. Visitors will be charged for parking starting Aug. 27, 2012, (start of classes) from 8 a.m. to 8 p.m., Monday through Friday, at a rate of $2.00 per 20 minutes, up to $10.00 per day. Parking will be free on weekends. Students, faculty and staﬀ will begin paying parking fees in January 2013. The Transportation Demand Management plan details the location of residence for members of the campus population as well as the travel behavior of campus employees. Approximately 45 percent of students live on campus and another 14 percent live less than one mile away. There are 8 percent of faculty and staﬀ who live less than one mile from campus and 23 percent who live within three miles. Councilman Rosendahl has since contacted LADOT. It was agreed that LMU may use the $24,000 budgeted for permits to help pay for a neighborhood parking survey (the ﬁrst step) to speed up the process. The survey would most likely be conducted in the ﬁrst quarter of 2013. To view a copy of the Master Plan (Speciﬁc Plan and Development Agreement), visit http://www.lmu.edu/sites/Community_home/Master_ Plan.htm To view meeting notes from the three Neighborhood Advisory Committee meetings, visit http://www.lmu.edu/sites/Community_home/Master_ Plan/Neighborhood_Advisory_Committee.htm If you do not have access to a computer and would like meeting notes and future NAC meeting notices mailed to you, please contact: Clarence Griﬃn at cegriﬃn@lmu.edu or 310-338-7854. Which of These Costly Mistakes Will You Make When You Sell Your Westchester Home? homesellers make 7 deadly mistakes that cost them literally thousands of dollars. The good news is that each and every one of these mistakes is entirely preventable. In answer to this issue, industry insiders have prepared a free special report entitled, “The 9 Step System to Get Your Home Sold Fast and For Top Dollar.” To hear a brief recorded message about how to order your free copy of this report, call 1(866)295-5661 and enter ID #1000. You can call anytime, 24 hours a day, 7 days a week. Call NOW to ﬁnd out how you can get the most money for your home. change his flight and couldn’t afford the cost. The entire team pitched in money so that he was able to make his flight. That night the team won their match, making it a winwin situation for all involved and brought the team closer together. So while many people move to Los Angeles without knowing anyone, the Westchester league of the World Dodgeball Society has brought a sense of community and friendship to more than just one. “When I first moved to Los Angeles, I knew no one,” claimed Quinian, “I’ve been playing dodgeball for two and a half years and all of my friends in L.A. I met through dodgeball.” For more information or to inquire about joining the league, visit dodgeball4ever.com/balls/homewestchester. Husband, Father, Friend. Lifelong resident and graduate of Westchester High School, Bruce Served the Community of Westchester as owner & operator of Percision Automotive for many years. Bruce’s greatest loves were all things aeronautical, classic cars and his family. Lunches were often spent at In n Out with Vickie watching the airplanes land. We will remember his smile and the many ways, in which he gave to us all, you will be forever missed. is so restricted, chances are it would never be down listed cause there are only a handful of places where you could go and see it, and this is one of the larger protected places.” An El Segundo Blue Butterﬂy sits on a buckwheat plant. Saturday Night Alive! Westchester Christian Community Church family invites you to “Saturday Night Alive” hosted by Minister Daniel E. Mackey. The evening will include praise dancing, singing, poetry, comedy, a live band, and refreshments. Please come out and join in the celebration. When: Saturday, August 11 @ 7 pm This event is designed for all Where: Westchester Christian Church, ages to attend and it is free to the 8740 La Tijera Blvd., Westchester community. No RSVPs required! More Info: (310) 645-4344 Please Join Pastor Crissina Johnson and the Congregation at: Sunday Worship Service at 10:30 a.m. • Sunday School 9 a.m. • Tuesday Prayer at 12 p.m. noon Family Fun Friday Nights at 6:30 p.m. • Youth Bible Study Thursday Nights at 7 p.m.
Best Desserts BEST OF: Truxton’s American Bistro 8611 Truxton Ave., Westchester • Truxtonsamericanbistro.com Tony P’s owners Tony Palermo and Danny Ringwood. Dear Property Owner, You may have seen our real estate signs around the community– ERA Matilla Realty. Our family has been doing business in this area since 1959. One segment of our business is property management. You may have seen our signs as well– Matilla Group Property Management. We want to offer you our property management solutions...If...you are tired of the day to day management of your building(s)...If...you are tired of phone calls from tenants....If...you just want less disturbances and more free time for yourself. If this is you – please – think about us! We can professionally handle the stresses that go with ownership and management. We manage 28 properties in this local area. Our occupancy ratios are near 100%. Most of our units are rented in less than 2 weeks. Our landlords are very pleased with our performance. Is the time right for you to make a change? Would you like more information? Then, please, go to our website’s home page at www.matillarealty.com and click on the property management tab. If you prefer to speak with me directly, please call (310) 306-9005 or (310) 748-0574. I hope we can be of service. FAVORITE: Tompkins Bar and Grill 8522 Lincoln Blvd, Westchester • t2barandgrill.com An assortment of Mexican dishes from Paco’s Tacos. Melody owners Christian Warren and Bobby Hughes. to everyone who helped make the 2012 Progressive Dinner a huge success. Together, we will raise more than $11,000 for the Youth and Government Program at the Westchester Family YMCA. Thank you for supporting our community. Playa Venice Sunrise Rotary Club Thanks You! • Over $20,000 awarded to local teachers for classroom grants • Support of McBride School for Disabled Children • Holiday Family Adoption • Music, Art and Speech scholarships for high school students • Leadership training weekend for high school students • Fire Station Pancake Breakfasts • Thanksgiving on Saturday for the homeless • Santa Tour • Cultural Dinner • Sponsorship of Fourth of July Parade and Jet to Jetty • Bingofest • LACRA Bowling Fundraiser ...and more! Best Sandwich Shop BEST OF: Olive It 6231 West 87th St. • Oliveit.com FAVORITE: Mendocino Farms 4724 Admiralty Way, Marina del Rey • mendocinofarms.com Stop by Olive It for a great selection of sandwiches and olives! Thank you for Voting Us Best Non-Proﬁ t! Olive It The Playa Sunrise Rotary meetings on Wednesdays at 7:15 am at the Courtyard by Marriott. Thank You for Naming Us Best Sandwich Shop! FAVORITE: Very Important Pet Wagz honors the “Fouche Way ,” a 7600 S Sepulveda Blvd., Westchester dog behavior program, to help ensure Myveryimportantpet.com that all pets have a pleasant grooming experience. for voting us Favorite Property Management Company. We are honored by your continued support! Let Us Rent Your Home Our expertise can eliminate the hassles of property management. Let us take care of renting your home, from marketing and tenant screening to lease negotiation and rent collection. 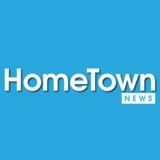 Thanks to Hometown News readers. “WNS: Best Private School!” Visit and see what makes Westside Neighborhood School the top choice of families looking for excellence. Westchester Watch Works is a family owned and operated business. Thank you to Our N e i g h b o rs F o r Vo t i n g Us Best Of ! Stay up-to-date on the community’s news and events by liking us on Facebook! BEST OF: Ben Maltz Gallery at Otis 9045 Lincoln Blvd., Westchester • otis.edu/benmaltzgallery Great Pyrenees dogs wow at this year’s parade. Jeff Blair of Jeff Blair Fitness. Rocket Fizz co-owners pose in front of hundreds of candies and sweets at the Lincoln Blvd. shop. Complimentary local pick-up and/or drop-off transportation services provided to our Customers. Complimentary local vehicle pick-up and/or delivery service provided for our Customers. A Tradition of Supporting Community Organizations and Events! At Playa West Automotive, There Are “No Problems - Only Solutions” Building loyal client relationships on a foundation of honesty, integrity, reliability and customer satisfaction is the hallmark of our success. Complete Auto Repair and Service. Servicing all vehicles, foreign and domestic, including vintage/classic autos. Our highly qualiﬁed, experienced technicians are all ASE Board certiﬁed and proven professionals. NEIGHBORHOOD COUNCIL OF WESTCHESTER / PLAYA Neighborhood Council Election Set for Oct. 28 The City of Los Angeles has selected Sunday, October 28, 2012, for the next Neighborhood Council of Westchester/ Playa election. Polls will be open from 10 a.m. to 4 p.m. at the Westchester Municipal Building Community Room. About half of the board seats will be on the ballot, and each �������������������������������������������������������������� your opportunity to get involved and help your community. Neighborhood Councils were created in the City of Los Angeles Charter as a way to encourage more involvement in City government and to make Los Angeles City government more responsive to local needs. The Neighborhood Council of ����������������������������������������������������������� give a larger voice to the residents, businesses and property owners in Westchester, Playa del Rey and Playa Vista. Ready to Get in Shape for Summer? to the homeless and other places where needed. Many women in the group have dedicated years to the cause. Florence Ebright has been with the group since 1970; Marion Scharf since 1989; Jackie Sharrar and Dolores Reed Waltz since 1993; and Mary Cairns since 1994. Many of the other ladies have been with the group since 2002 and following. This has been a labor of love for the group who has used their sewing skills to provide comfort to those in need. For the women, it provides outreach and a way to spread their faith to others. For more information on this program, please contact the church office at (310) 670-5422. Westchester Lutheran Church is located at 7831 S. Sepulveda Blvd. in Westchester. Emerson Ave in Westchester. For more info, please visit visitationschool.org or call Terry O’Connor at (310) 994-9904. Westside Voices Concert On Sunday, August 26 at 3:30 p.m., join the Westside Voices for a “Sounds of Summer” concert. The concert will take place at the Westchester United Methodist Church Fellowship Hall, located at 8064 Emerson Avenue in Westchester. There is a suggested donation of $10 Dessert reception following the concert. To make reservations, please call Penny at (310) 670-3777. Marina del Rey Concert Series Enjoy the beautiful summer weather by taking in a concert at Burton Chace Park for the 2012 Marina del Rey Summer Concert Series. Attendees can enjoy “Symphonic Thursdays” performed by the 75member Marina del Rey Summer Symphony led by Music Director and Conductor, Frank Fetta or if you enjoy more contemporary music, “Pop Saturdays” may make the perfect time to head down to the Marina. These free concerts are held on the waterfront. Concerts start at 7 p.m. and generally last two hours. Audience members may bring low-beach chairs or blankets and seating is available on a first-come, first-serve basis. The park is located at 13650 Mindanao way in Marina Del Rey. In support of the four Thursday evening classical concerts, the Marina del Rey Summer WaterBus operates from 5 p.m. – Midnight those evenings. It will also be operating as scheduled (11 a.m. – Midnight), for each Saturday performance. Performances include: Classical Concert Dates Thursday, August 9: Christina and Michelle Naughton, piano Thursday, August 23: Lindsay Deutsch, violin Pop Concert Dates Saturday, August 4: Arturo Sandoval Saturday, August 18: Ambrosia For more info, please visit beaches. lacounty.gov. First Friday @ 87th Street & Truxton Ave.
Congratulations to Westchester Lutheran’s “Best Overall” Float! Page 25 • your community newspaper • we will be able to find products made here on the same shelves with those made elsewhere. I must confess that I usually forget to do that. There are products that I like and just reach for automatically, and I’ve no idea if they are made in the U.S. or not. Alas, this is August and not January, so I can’t make an actual New Year’s Resolution regarding my purchases. All the same, in an effort to help our economy in any way I can, I think now is as good a time as any to begin to read labels. Maybe if we all took the few minutes it takes to do that, even if it costs us a few pennies more to buy “made in the U.S.A.,” we can help bring some jobs home. Despite what my detractors think, I really do love this country. as an athlete competing in the Olympics. The athlete uses his or her strengths to express what is in his or her heart. The “I can” formed in the heart of the athlete is different from the “I can” found in your heart, but the “I can” found in you is just as important. Life is full of “moments” when you can lead a remarkable life. My wish for you is to experience the magic of the Olympics in your life. What makes each moment amazing is when it is intentionally lived from a perspective coming from a knowing deep within you. Special moments can happen when you authentically connect to yourself and share that connection with others. When you believe, “I can” the spark of imagination can ignite within you a flame to carry you to achieve your dreams. Fay Craton, M.A. is a Licensed Marriage and Family Therapist (mfc40011), which is the psychology license specializing in relationships and she has an office in Westchester. Visit her website at communicationtriangle. com or (310) 645-6762.
focused on eating at the dining room table. However, you may discover additional projects in your attempt to clear the dining room table. Start in one place and work your way around the room: If you can’t decide where to start, grab an empty paper towel roll, close your eyes, then hold the roll up to your eyes, open your eyes and begin in the area you see through the roll. In summary, if all things are equally important, and you are not facing major consequences, it doesn’t matter so much how or where you begin, just that you begin, and then that you keep going until completion. Mishele Vieira, CPO®, owner of Away With Chaos, helps underorganized people make room for what matters most in their home. selling home, call for a or buy your with just any realtor... free home evaluation. Advertise your Listing with Us! So Make Your Own Holiday: Call it “Move Into a New Home Day!” Call me so we can In Real Estate, Experience Matters, So Call Me! It’s important to get in front of both potential home buyers and sellers. The Westchester/Playa del Rey HomeTown News is here to help you reach out to local residents, while promoting your listings, as well as you and your business and/or company. Westchester Del Rey Little League Major Superstars have successful season. The Superstars, managed by Jim Evans and coached by James Cooksey, Brian Dennis and Keith Parker, have a roster of 12 players with Nicole Aguirre, Adrienne Calderon, Sloan Cooksey, Morgan Dennis, Casey Gabriel, Jasmine Gomez, Serena Gonzalez, Madisen Mantooth, Imani Moore, Mia Parker, Coral Smith and Jessi Stokx. The Superstars took first place during the regular season by compiling a record of 14 wins, no losses and one tie. The team was also undefeated in interleague play against neighboring Little League teams. Having won the regular season and league playoffs, the Superstars qualified for the District 37 Little League Tournament of Champions (TOC) and completed the season with an overall record of 27 wins, 1 loss and 1 tie. Baseball Pitch, Hit and Run Champion. Westchester resident Sam Stanford took home the title of 2012 Aquafina Major League Baseball Pitch, Hit and Run Champion (9-10 Year-Old Boys’ Division) at a July 9 event in Missouri. More than 685,000 youth participated in over 4,000 competitions that took place across North America to qualify to make it to Missouri before the winners were determined. Congrats Sam! EL SEGUNDO CARWASH Westchester Babe Ruth Boys Win Southern California Championship. The Westchester Babe Ruth (14-year old and under) baseball team defeated La Crescenta 7-5 in July to win the Southern California State Baseball Championship. Behind stellar pitching and an explosive offense, Westchester outscored opponents 27-11 in the last three games. The team is comprised of players from Westchester, Marina del Rey, Playa Vista, Playa del Rey and surrounding cities. The Westchester 14U Babe Ruth team includes, Avery Allen, Christian Amador, Jordan Caines, Reggie Castro, Anthony Chavez, Grant Craddolph, Angel de la Torre, Lawrence “LJ” Gilliam, AJ Inatsugu, Carlos Jacobo, Matthew Kanfer, Matthew Kaplan, Ethan Lazar, Mario Morales and Jason Zeidman. The team is managed by John Lopatto and is coached by Barry Craddolph and Alex Galaviz. IM5 Wows at Visitation. IM5Band members pose onstage at Visitation School’s July 20 Food Truck Friday Night, with special guests and Visitation School students. From left to right: Cole Pendery, Madison Marozik, “Will,” Hayley McIntosh, Dana Vaughns, Rebecca O’Connor, “Dalton” and Gabe Morales.